At one point in our lives, we’ve all been underestimated. Maybe even verbally torn down to the point where we see our flaws and think that we’ll never amount to anything. 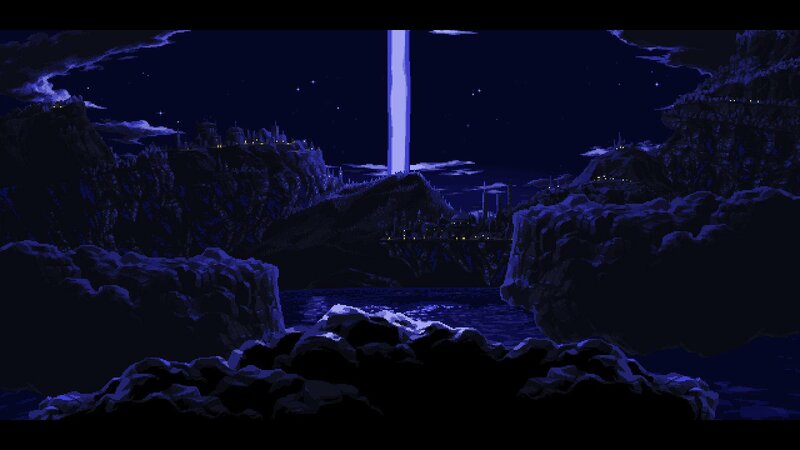 At the start of Owlboy, we are treated to Otus being torn down, verbally, by his instructor and it immediately sucked me in. 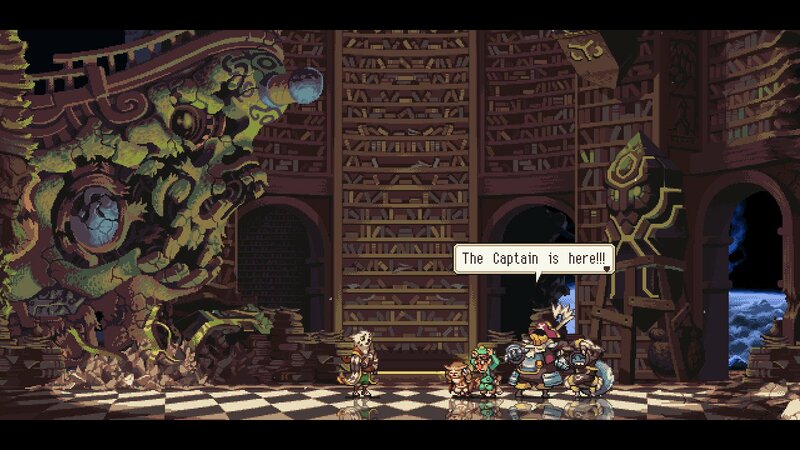 Owlboy, a 2D narrative-driven, Metroidvania game produced by D-Pad Studio is rife with these kinds of themes and premises. And because of this exceptional writing, I found myself drawn in on a cathartic journey to save the world with Otus and friends. Owlboy follows Otus, an owl denizen of floating isles, as he undertakes his owl training. Unfortunately, Otus cannot speak and is looked down upon because of it. During his training, Otus is given an Owl Cloak that enables him to fly but because of his inability to grasp the concepts right away, he’s written off and discharged from his instructor. Shortly after, a band of pirates appear to ravage the owl city in search of these mysterious relics that hold the power to destroy the world. 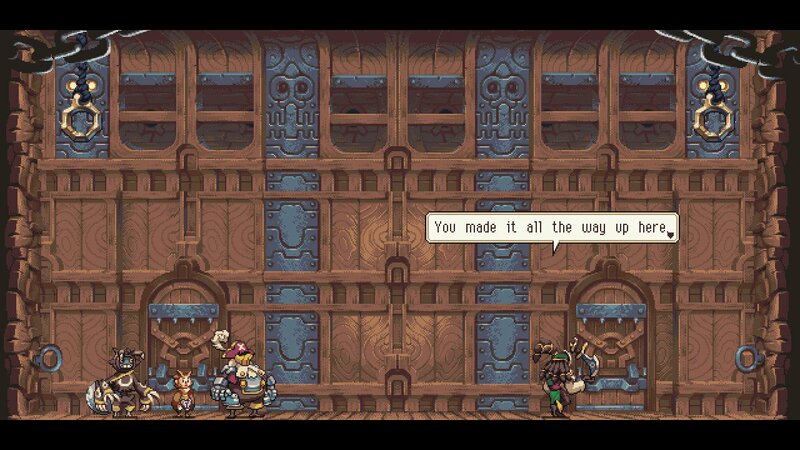 At this point, Otus and friends are spurred on a course to stop the band of pirates and recover the stolen relics. One thing I was not expecting about Otus’ tale in Owlboy is it’s grip upon my heart in it’s character development. Otus is often ridiculed and verbally berated by those around him because of some lack of skill or perceived failure. Thankfully, Otus’ friend, Geddy, is there to encourage him. But Geddy, himself, wrestles with fear and a lack of courage in the face of danger. Otus and Geddy are an interesting dynamic to watch play out throughout the game and even more heart-warming to see them overcome the things that they are often ridiculed for. Otus wants to help people, despite his fear, and you see this encourage Geddy throughout the game. It’s a delight to watch. There’s more characters that come into play with Otus’ party but, due to spoilers, I won’t divulge too deeply here. But I will add that, like Celeste, Owlboy deals with some hefty themes that any gamer can relate to on some level. The enemies, also, are relatable in a sense. If you play the game, you’ll see what I mean. Speaking of the enemies, the head captain, Molstrom (sounds an awful lot like “maelstrom”), was incredibly menacing. The way he’s designed exudes intimidation, as he stands a full foot, or two, taller than everyone else, wielding a giant iron claw and axe. Whenever he’s on screen, I’m taken back to my younger years when Shredder would appear before the Teenage Mutant Ninja Turtles to wreak havoc. Owlboy plays akin to a Metroidvania, in that, you’ll explore various areas with the opportunity to return to them at a later time, preferably after you’ve received an upgrade or two. But unlike Metroid, or Castlevania, you cannot rely solely on your own skill to best puzzles and enemies. See, Otus only has a spin attack, and a roll, along with the ability to fly. That’s it. The game is designed in a way for you to rely on Otus’ friends to navigate different areas and temples. For example, Geddy has a laser pistol that’s great for taking down enemies, and the occasional wooden box. Another friend, Alphonse, has a fire-shotgun that’s great for breaking down walls, vines, etc. You’ll encounter more friends throughout the story that will open up more possibilities for exploration and offense/defense. While this may seem cumbersome at first, it quickly becomes thrilling as you’re swapping between friends on the fly while dodging enemies. I found the strategic element of the combat in Owlboy to be difficult, but never frustrating. Another aspect of the gameplay I thoroughly enjoyed was how upgrades are handled. As you play through the game, you’ll collect coins that are yours to keep throughout your play through. You’ll eventually come across a shop whose owner is either hyped up on sugar or mildly crazy. Here you’ll find that upgrades are unlocked based on how many coins you have collected. Want Geddy’s pistol upgrade? You’ll need to collect 200 coins (I can’t recall what the actual amount is so I’m using 200 as an illustration). At 500 coins, you’ll unlock a new upgrade for Otus. At 600, you’ll get a health upgrade. This system encouraged me to grab as many coins as I could because I always knew what I was going for. Sure, in some ways it’s similar to other games but in Owlboy, it was so streamlined that I appreciated it, greatly. 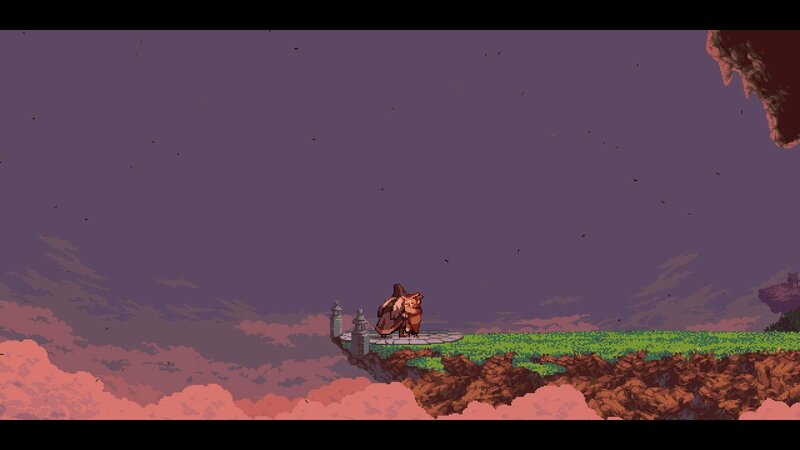 The only point of contention I had with Owlboy was that, at two points towards the end of the game, I had a difficult time figuring out where to go next. While this did net me some extra coins due to exploration, it was a little frustrating that I felt lost. However, this may not happen to everyone else playing the game. 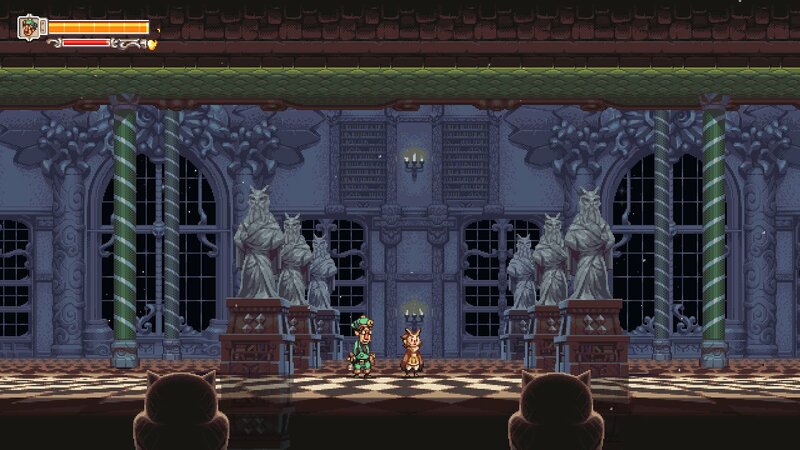 I’m not going to lie, the soundtrack for Owlboy is solid. As a matter of fact, I am listening to it while writing this review. In many ways, it reminds me of Ori & the Blind Forest’s soundtrack with songs that lift you up, soaring amongst the clouds with the owls while other tracks ensnare you with dread at the looming pirate threat. It’s an evocative soundtrack and one that’s sure to stay in your head, long after you’ve finished your play-session. Each song fits their area in the game, as well. Upon first entering the Owl Temple, you’re greeted with wondrous, mysterious notes that push you to explore. As you’re resting in Vellie, the music is peaceful yet enthused with the smallest hint of energy to make you want to go back out to the world. The final area in the game has some of the most ominous, mysterious, and yet thrilling music of any game I’ve played yet. The music is just incredible! Owlboy surprised me. When I first started playing, the slow-burn of the narrative had me worried but the gameplay kept me going to the explosive opening of the game. 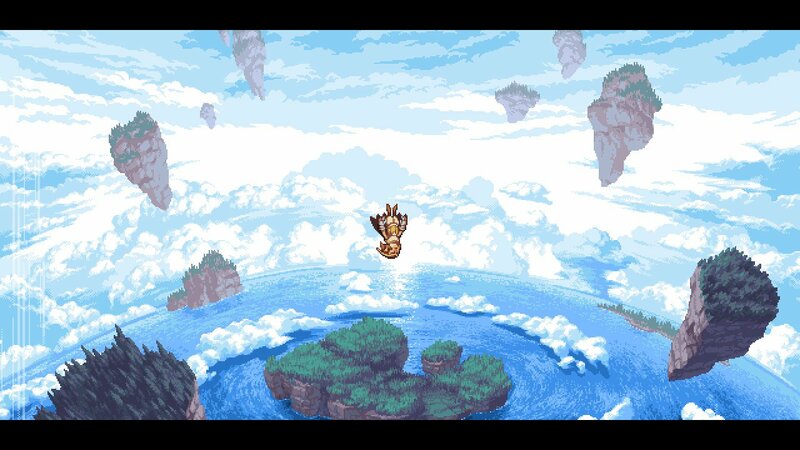 I thoroughly enjoyed Owlboy, despite the slightly sluggish/floaty flight controls and the slow-pacing of the intro. The art in the game is some of the best in gaming, the music is fantastic (seriously, I’m about to hit Purchase on the album in iTunes), and the character development is something we all can relate with on some level. Seriously, go play Owlboy and enjoy!